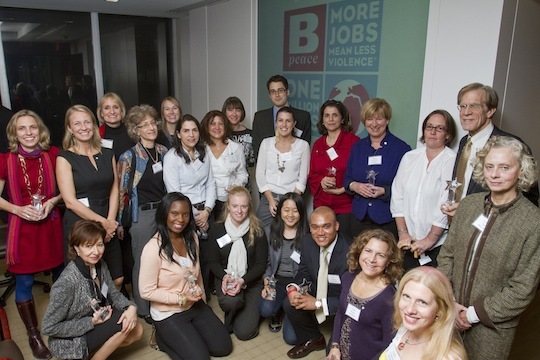 In New York each November, Bpeace’s Annual Meeting brings members together to celebrate their achievements. Bpeacers from Seattle, San Francisco and Los Angeles, travel to convene with their east coast Bpeace colleagues, meeting many of them for the first time, even though they may have been collaborating with them for months. Sabra Richardson (Brooklyn, NY) (at right) has a long track record of achievements as an innovator and implementer. As the chair of the Bpeace Rwanda Team, she helped launch the Economic Development Fund in partnership with Fina Bank. This Fund enables Rwandan businesswomen to access the capital they need to expand. Sabra worked with nearly 20 Rwandan Fast Runners to help them track their finances. She traveled to Rwanda three times, most recently to help train the staff of the Sweet Dreams ice cream shop. As a member of the Bpeace Board of Directors, she was the voice for clarity and action. Last year we instituted the Extreme Bpeacer Award. This year’s winner is Gita Patel, (New Brunswick, NJ). She traveled to El Salvador on our first expedition; hosted visiting Rwandan Fast Runners; cajoled her local bar to host a Bpeace fundraiser; is currently leading an important membership recruitment drive for business professionals of Salvadoran heritage; and knows how to party with our Afghans. Donna Fleetwood (Mechanicsburg, PA) was 2010’s winner of the first Extreme Bpeacer VERA. For 2011, we just had to give her EXTREME BPEACER 2.0, because she is, well, so extreme. She fundraises; hosts Rwandans; hosts Afghans; is Latifa’s Advocate as she builds a kitchen renovation business; she sells DOSTI soccer balls; creates events, and recruits members in Harrisburg, Pennsylvania. Mojdeh Barros (Nashua, NH) used her hard-earned experience as an IT professional to remotely advise Afghan Fast Runners Azi and Farangis, who each own an IT firms. Kelly Kaplan (Upper Montclair, NY) assembled a library of videos to bring new hair styling and make-up techniques to Zarghuna, as she expands the capabilities of her four beauty salons in Mazar, Afghanistan. Cynthia Fisher (North Anson, ME) tapped her food processing network to recruit new members/volunteers to advise Salvadoran Fast Runner La Canasta, which produces dried spices and powdered fruit drinks. Join Bpeace and experience the world--virtually, or in person. Johnna Hobgood (Woodinville, WA), Phyllis Rosen (Scarsdale, NY) and Jonathan Liljegren (Vienna, VA) convened in Dubai to provide intense coaching in marketing, HR and finance to our Afghan Fast Runners. Janis Grover (Stockton, NJ) and Laura Rotter (White Plains, NY) are pioneers as Bpeace’s First Traveling Mentors to El Salvador. They worked with La Canasta to improve product profitability. Jerrie Gullick (Brooklyn, NY) traveled to Butare, Rwanda with QuickBooks in hand, to help Sweet Dreams Ice Cream scoop out more profitability. Karen Vander Linde (Bethesda, MD) facilitated a two-day El Salvador brainstorming that put both strategy and implementation around Bpeace’s entry into El Salvador; and she also co-authored a service-pricing workbook for Afghanistan. There are many channels Bpeace members use to fundraise to give Bpeace the financial bandwidth to conduct our work. Ann Callison (New York, NY), Loretta Davis (Tuxedo Park, NY) and Ayanna Gabriel (Middletown, NY) were top fundraisers in the One Million Jobs campaign. “Under promise, over deliver” is a Bpeace catchword. These Bpeace members consistently offer solid ideas and then follow-through in an outstanding way: Pam Massenburg (Old Bridge, NJ), Carole Vaporean (Mount Vernon, NY), Liz Wald (New York, NY), Pam Varkony (Allentown, PA) and the following members of the Bpeace Young Professionals--Kara Castagna (Brooklyn, NY), Biz Ghormley (Brooklyn, NY), Neil Charran (Stamford, CT), Liz Pulver (Brooklyn, NY) and Aliana Pineiro (Ecuador). David Montieth (Ridgefield, CT) identified U.S. soccer ball experts and dove into the details to improve the quality, pricing, and market opportunities for DOSTI soccer balls. 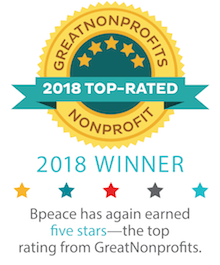 Some Bpeace members join and immediately find where they want to play. For others it may take awhile. It took 8 years for Carmen Barros (New York, NY) before she could invest her Spanish translation skills in the way she always wanted. Carmen is recognized for her interpretation work on the third Bpeace expedition to El Salvador. On the opposite end, a PIONEER VERA to Meave Murphy (New York, NY) for joining and immediately participating in an El Salvador expedition. Bpeace measures outcomes. We measure the jobs our Fast Runners create, how many local vendors they use, what kind of training they give their employees. We uncover this data through our annual Census. Peter Laird (New York, NY) and Yuan Geng (Boston, MA) and the Bpeace Census team did a particularly outstanding job this year.